For the last three years I have been contributing to Stars on Canvas an amazing event which raises money for cancer sufferers through the Willow Foundation which was setup by Bob Wilson. Bob is one of the good guys – a consummate professional in his footballing days he was always respected by fans and fellow players whether the were aligned his Arsenal team or not. Being a Chelsea fan my idol was Peter ‘The Cat’ Bonetti (ironically) but Bob was still a welcome sight even if his shorts were slung a little too high. Bob Wilson and his wife are two of the most wonderful People you could meet. 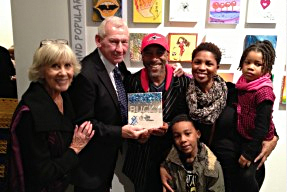 My family had a great time at the launch of ‘Stars On Canvas. I have met many famous faces, not only from the world of football but many other genres. The first ever launch I went to, ran straight into John Hurt at the front door. I introduced myself to a slightly confused looking Mr Hurt, I was luckily saved by his wife who promptly told him who I was. Needless to say my day was made. 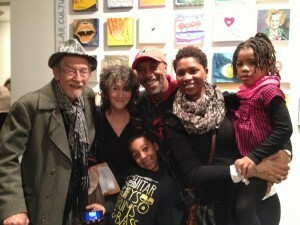 John Hurt and his wife are always on hand at the launch of ‘Stars On Canvas’ they are always willing to take photos and chat to everyone. A real stalwart. I always have a great time at the Willow Foundation functions and Bob and his fabulous wife’s hospitality are second to none. 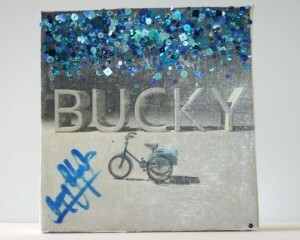 You can bid to own my contribution from this year (see below) here. The Willow Foundation was founded in 1999 by former Arsenal goalkeeper and TV presenter, Bob Wilson and his wife, Megs as a lasting memorial to their daughter, Anna, who died of cancer aged 31, it is the only charity in the UK to provide positive and life-enhancing Special Days for seriously ill 16 to 40 year olds. Labyrinth 30th Anniversary – The legend returns! Join my mailing list for monthly news updates!